On September 13, 1959, when Elvis Presley, a 24-year-old singing sensation, met Priscilla Beaulieu, the daughter of an Air Force officer, in Wisebaden, West Germany, it was love at first sight for him. The delicate, poised brunette beauty affected him so powerfully that he put her in a special category–and such careful handling was necessary because, for one thing, she was 14 years old. Eight years later, after Priscilla had moved into Presley’s home in Tennessee while she finished high school–with her parents’ approval–the two of them were married in Las Vegas. 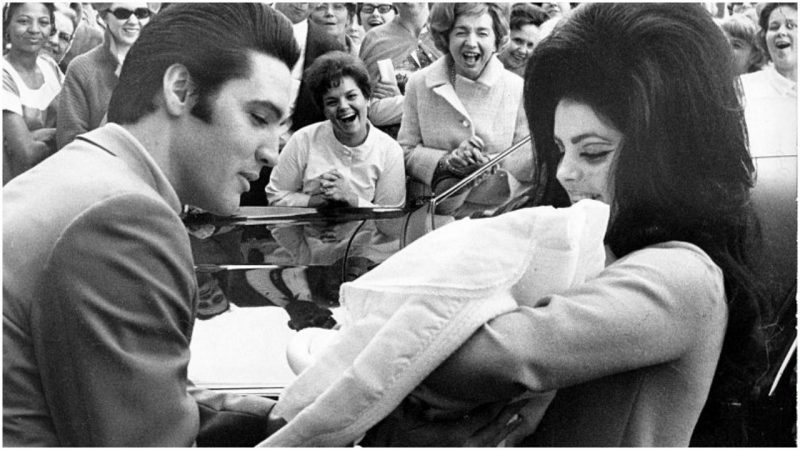 The birth of their daughter, Lisa Marie, followed a year later. But the marriage did not last, with infidelities on both sides, his preoccupation with his career, and Presley’s escalating drug use as the commonly given reasons. On November 11, 2017, the couple’s divorce papers are set to go on auction in England. The divorce document, dated August 15 1972, is “a fabulous piece of show business history,” said Henry Aldridge & Son auctioneer Andrew Aldridge. As part of the settlement, Elvis signed over to Priscilla his 1971 Mercedes Benz, his 1969 Cadillac Eldorado, his Harley-Davidson motorbike, and $100,000. 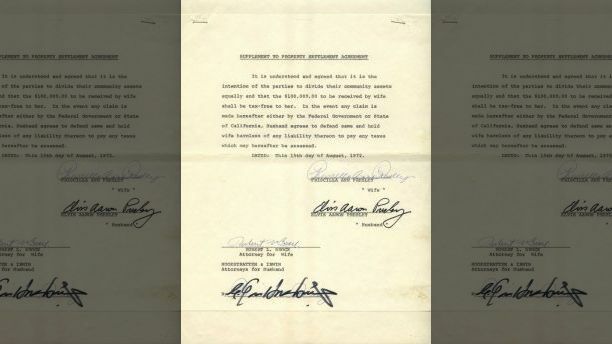 The sum was to be paid in two sections: $50,000 within five days of the agreement and $50,000 on or before August 20 1973. Priscilla would also receive half of the income from the couple’s three residences in Beverly Hills, Los Angeles and Palm Springs. “The vendor is an American collector who saw the publicity and result surrounding Aldridge’s previous auction of Elvis material and decided to offer the item,” according to Antique Trade Gazette. Of perhaps keener interest to collectors than the distribution of property and income is the presence of Elvis Presley’s full signature, which is rarely seen. Elvis Presley died of heart failure on August 16, 1977. After his father, Vernon Presley, died, Priscilla became co-executor of the Presley Estate. She has since focused on turning the Presley Estate into a successful organization consisting of the famous Graceland Mansion, a worldwide licensing program, merchandising, music publishing, and television and video projects. Forty years after his death, Elvis Presley’s net worth has risen to an estimated $300 million, according to Celebrity Net Worth.